While we had every intention of eating home for the majority of the weekend (we have a lot of leftovers), it didn't really happen. We woke up on Friday morning craving Chinese, so we planned to go downtown for some that night. Now, Jonathan and I have been to a Jack in the Box before, but it's been a couple years. When we were in Seattle (the week we got engaged), we had Jack in the Box, and had a good experience. We have a few near us in Mountain View, so we gave it a try a week ago. I'm sure glad we did, because they really are good! Jonathan got the Ultimate Cheeseburger, which has both American and Swiss cheese and a onion-mayo sauce. I had the Chipotle Chicken Ciabatta, that had a delicious sauce, bacon, and cheddar cheese (I got it sans lettuce, of course). We both really enjoyed our choices, and that of the other. I had the "seasoned" curly fries, but they weren't that good and I wouldn't waste money on them again. Jonathan got the Sampler Trio, which included two chicken eggrolls, a few mozzarella sticks, and a few jalapeno poppers. The eggrolls were okay, about what you'd expect from a fast food place. I didn't try the other items, but Jonathan said that the mozzarella sticks were dried out and not very gooey, as mozzarella should be. He'll have to tell you about the poppers at some point, because I don't remember what his reaction was. Oh, and I had rootbeer since they had Barq's and I was in the mood. The funny thing was, on the way home (we got it to-go), Jonathan went to have a sip of it and had the strangest look on his face, as he was expecting it to be Coke, haha. I can completely relate though, I absolutely hate it when I'm expecting one beverage and it's something else... the psychological affect on the taste is gross. With the menu being so expansive (and some great looking breakfast options as well), I'm sure we'll be back. For dinner, Jonathan and I went to a sushi place downtown (off Dana), called Sushi Tomi (make sure you click on English so you can read the site, LoL). The place was packed, even though it was Sunday night at 7:30. We waited about ten minutes for a table, but it was well worth the wait. We both had the combination special, I chose sashimi and gyoza, Jonathan had the sashimi and the spicy tuna roll. We were first served salads, with the most delicious dressing. We couldn't quite pinpoint the taste, although it was very creamy and had sesame seeds. I thought it tasted a little like bacon and parmesan, but clearly that wasn't it. After that was the miso soup, which was not as salty as some miso, so I enjoyed it quite well. We hardly had time to finish it before our entrees arrived. My gyoza (deep-fried pork potstickers) were delicious, although I liked them better with soy sauce than with the wine-vinegary sauce with which they are served. There were six pieces, which matched Jonathan's six pieces of spicy tuna roll. And boy, were they spicy! Neither of us had previously had anything similar. This tuna was sort of ground up and made very spicy. 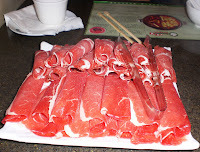 The sashimi was eight pieces, three each of tuna and salmon, and two of another fish which greatly resembled tuna, but was a little darker and a little tougher (and also a little fattier). It was all very good, and I was definitely stuffed by the time I had my orange section as a finisher. We both agreed that it was a good deal, and might be returning before long. For my birthday, Jonathan arranged for a few work friends to join us for lunch at Amarin Thai Cuisine in downtown Mountain View. 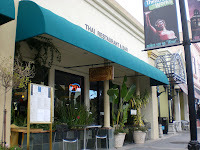 I was excited, as it was our first Thai in California, and that's one of my favorites. We arrived about ten minutes early, and while I was hoping for one of their tables that's on the floor with cushions, it seems those are only available during dinner. We did get a large table though, and it was nice that Andrew & Kit and Vanessa & Emmanuel were able to join us. Jonathan had some chicken pa-nang curry (a reddish-brown kind), with basil and I had the grilled scallop with garlic, cilantro, onion, two kinds of peppers, and corn. It was in a tasty marinade sauce, and we both enjoyed the white rice that it came with. Everyone else at the table also got various kinds of curry, except Emmanuel, who had the mango chicken special. My scallops were delicious, but the vegetables were a little odd (too heavy on the corn). Jonathan enjoyed his curry, and is looking forward to trying other varieties while we were there. Overall, though, I don't think we'll be heading back to this Thai place, when you consider the many other possibilities there are here! Vanessa and Emmanuel had been there before and weren't impressed with their pad thai. And if you don't have good pad thai, you can't be a good Thai place, in my opinion. In-N-Out Burger is a chain, and is pretty big out here. I had been to one before, last time I was in the Bay Area (May/June 2006), but I didn't really remember it, and Jonathan had never been. We just beat the lunch rush (arriving at 11:45am), and we are sure glad we did! The menu is very simple (as you can see, there's not much "public" variation to the options), and we ordered a #1 and a #2. We both found the burgers to be great (I had the cheeseburger, JB had the double), the sauce/spread gets two thumbs up, and the buns were nicely toasted. They were heavy on the onion, but we both like onion so no problems there. I didn't really care for the fries (felt they had no flavor), but now I know. Oh, I bet you're wondering why I used the term "public" menu before... they have a secret menu, just for insiders. Because their motto is simplicity, you have to be "in the know" that you can get a few different things, such as an "animal burger" or "fries well-done." We wanted to try their original menu first, but next time we'll definitely study the secret menu and order from that. TOGO'S is a sandwich place, very similar to Subway. They're a chain, so perhaps you've been to one before. We hadn't and were in the mood for subs, so we gave it a try. I felt like a soup-and-sandwich combo, but the soups of the day were not appealing, so I went with a regular Turkey Club on "dutch crunch" bread. Jonathan tried the Hot Pastrami on white. He enjoyed the pastrami, noting that we see it often so it must be popular in this area. Mine was pretty good, although the bacon could have been crisper. Dutch Crunch bread is a white bread with little "crunchy" pieces in the crust. However (maybe because it was late in the day), my crust wasn't crunchy, so it was very similar to plain white bread. Interestingly, neither sandwich had cheese on it. There were a lot of things on the menu, so I imagine we'll try it again sometime. Two weeks after we moved to California, the ELDPs (the program that Jonathan is in which allowed us to move out here) had a get-together at Faultline Brewing Company. Ten people came - 6 ELDPs and 4 significant others. It was nice to meet some new people, and try a new place. I had pear cider, which was delicious. It's kind of exactly what you'd expect, but a bit crisper in taste. Jonathan tried Indian Pale Ale, which tasted like any other beer to me. We had the pork-and-shrimp potstickers with chili-mint rice as an appetizer, and it was quite good. If you like a crisp potsticker, you might be a little disappointed, but the insides are very flavorful. As an entree, we both ordered the Smoked Chicken Penne, but I ordered it without mushrooms. I found it to be overly-smoky, and the garlic in the brie sauce was undetectable. Jonathan found it just right, and devoured the sauce. We combined leftovers and I had them for dinner the next night (while Jonathan had our leftovers from La Costena). We haven't had any dessert since we've been in California, so last night Jonathan suggested we find some frozen custard. After an internet search, i t seems the nearest frozen custard is about twenty minutes away, in San Jose. So, we headed into downtown to get some gelato at Gelato Classico. The last few times we've gone by the shop, the line has been pretty long, so we were surprised when we walked right in. I got the tiramisu in an italian cone (nothing special about it, tastes just like a normal sugar cone), and Jonathan got the peanut butter cup in a dish. The tiramisu was good, with pieces of cake and everything. Jonathan enjoyed his as well, but I can't speak to how it tasted since I don't eat peanut butter. They had a lot of flavors that I want to try in the future, so I'm sure we'll be back there before long. We got up, had breakfast, and took the Caltrain into San Francisco today. We stopped in Metreon (a center with several restaurants, a couple stores, an AMC 15 movie theater, and an arcade) for lunch. Jonathan saw that Sanraku had wonderful reviews (and I saw it mentioned in Frommer's as well), so we stopped there. We were seated quickly (not very busy for noon on a Saturday), and were served nice, cool water while we read the menu. Jonathan chose the Sushi Special, and I went with the Sashimi and Chicken Teriyaki Combo. We had piping hot miso soup brought out, and it was pretty good. We hardly had time to finish the coup when our entrees had arrived. My sashimi (raw fish without the rice) was 5 pieces of chef's choice, and I was glad to see three big pieces of tuna and two slabs of salmon. The tuna was very good, among the best I've had. The salmon was a bit much on its own (I should mention I struggled to pick up a piece with my chopsticks, it was so large! ), but still good. The wasabi was good, but the ginger was a little off. My chicken teriyaki was in a delectable sauce, and the rice it came with was good and sticky. 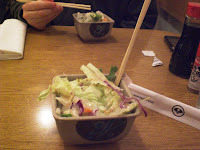 The salad was a bit much, mostly since it had a strange dressing (not ginger, not soy, something I had never before encountered with Japanese cuisine). Jonathan's special came with 6 pieces of nigiri and 6 pieces of California Roll. However, a California roll out here is not what it is in Florida. Here it has crab, avocado, and cucumber, rice on the outside, and sprinkled with roe. His nigiri ranged from tuna to salmon to tamago (like a sweet egg omelet with a custardy taste) to shrimp to whitefish to a roll of just roe and rice. The tamago was different, but overall he enjoyed the selection. Jonathan was working on a project at home today, so we were able to have lunch together. 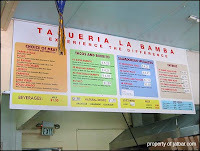 We decided to have Mexican, and after both researching a bit, we landed on the same choice: Taqueria La Bamba. There are two in Mountain View, an original and a second one downtown. We chose to try out the original, and enjoyed it. Although parking was a bit rough (1:30pm on a Friday), service was very fast. I ordered a chicken burrito, Jonathan had the quesadilla suiza. The burrito included rice, shredded chicken, sour cream, cilantro, guacamole, and cheese (I opted for no beans). The tortilla itself was rather thick, but other than that it was pretty good. Jonathan's quesadilla was cheesy with plenty of steak, he said he'd definitely get it again. There were also a few other things on the menu we're dying to try (carnitas and pupusas). We went downtown to watch the second half of the BCS Championship game. We decided to check out St. Stephens Green Pub, which was pretty decent. The build-your-own-burger is a little overpriced, but it was cooked just as I requested, and it was good. The fries were very good, in fact, the only thing really lacking in my meal was a pickle. Jonathan had the Chicken-Mushroom pot pie. He was a big fan of the gravy, and said the vegetables were steamed to perfection. I thought his mashed potatoes were a little buttery, but he enjoyed them. We headed downtown for Chinese. We headed into downtown Mountain View (about four blocks away). We walked Castro Street, and passed at least thirty restaurants before reaching the end of the area. We decided on uWink, a "social entertainment restaurant." 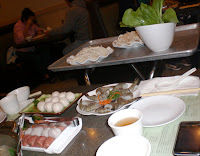 It sure was different, allowing us to order from the screens in front of us, without a waitress needing to come by. There were some great drink specials, and we tried to Appetizer Sampler (don't get the onion strings). I had the garlic chicken pasta (decent), and Jonathan tried the macaroni and cheese (plentiful!). What made the restaurant a good time were the giant projection screens showing the sports games and hit television shows, and the fact that there were more games on the machines than we could play in the (nearly) two hours we were there. Cool place, would recommend (and will probably take a few friends there when they come to visit...). We were flying from Orlando to San Jose, and the flight was just over four hours to Denver. Once in Denver, we stopped for a casual lunch. We'd both recommend the italiano panini at Jimmy's.